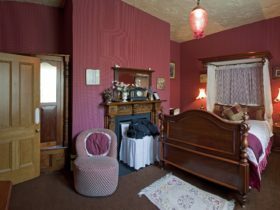 Explorers Lodge B & B is a charming New England house set in lovely gardens in a quiet area of New Norfolk 30 minutes from Hobart. 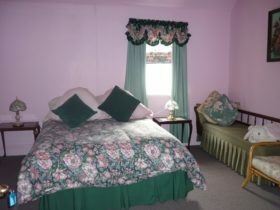 The bed and breakfast accommodation consist of three ensuite bedrooms with Queen or King beds. A private lounge/library, sunroom and separate dining room are available for guests. The self-catering apartment with private entrance has a large ensuite King bedroom with Kitchenette, a small lounge & dining area. The balcony, with barbecue, overlooks the garden and the hills beyond. Light breakfast provisions are provided daily. 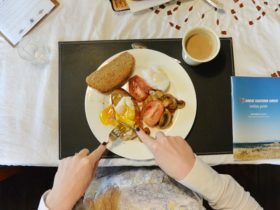 Tariff for bed & breakfast rooms includes a full cooked breakfast. Wi-Fi is free. Attractions include the historic buildings of Willow Court, antique shops and the Agrarian Kitchen Eatery and Cooking School. 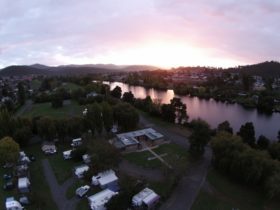 The Derwent River promenade is a favourite walk as is paddling on the Derwent River. 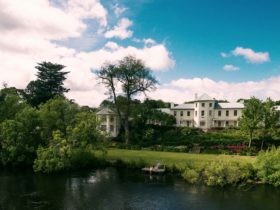 Nearby are the Salmon Ponds, beautiful Mount Field National Park, and MONA is only a 20-minute drive. Typically an Apartment has one or more bedrooms, a separate living area, cooking facilities and its own bathing and toilet facilities, all accessed from within the apartment. Light breakfast provisions are included for the first morning.